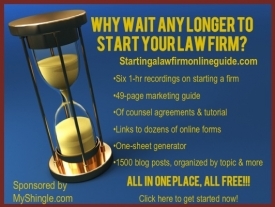 Let’s face it, marketing a solo or small law firm isn’t always candy canes and unicorns. Face to face meetings or calls can lead to rejection or apologetic sorry-I-don’t-have-any-cases-to-refer-right-now while digital marketing efforts like blogging or social media or a spendy SEO campaign often result in crickets rather than clients. Marketing studies show that it can take 6 to 8 touches to generate a viable sales lead, let alone a sale and during that time, most lawyers can easily grow discouraged. So when your marketing campaign is going south, don’t double down on more of the same, or worse, let your desperation make you vulnerable to high pressure, low return marketing scams. Instead, take a step back and just say something nice. Here’s what I mean. Let’s say you just saw an article in the bar journal by your former boss at biglaw whom you haven’t spoken to in years. Why not drop a quick email or card to congratulate her? Or perhaps there’s a lawyer in your field whom you’ve admired from afar who just won an obscure but important case in your field. Give him a call by phone or send a note to compliment his legal prowess and share a hearty “job well done.” The same approach can apply to an opposing counsel who beat you fair and square and forced you to up your game, a member of a listserve or colleague on social media or the sponsor of an event that you attended and enjoyed. And don’t forget your hardworking and long-suffering staff – saying something nice about a recent brief or a task when they went above and beyond the call of duty is always appreciated. Anything goes, really – with the only rule being that your compliments should be genuine and unique to the recipient rather than something sent by a bot or with the tone and attitude of a sycophant angling for something in return. As I said at the outset, marketing isn’t always fun and when it doesn’t work, it can be frustrating. Saying something nice to someone else won’t guarantee you a steady stream of clients but it’s a nice way to make a sometimes distasteful chore more palatable. So now it’s time to share. What nice thing will you say today?